"And then there’s Portia and Melissa Miller. This lovely talented young lady not only handles the verse as if it were her native tongue, she uses it to build a character and a performance that is direct, genuine, spontaneous and witty - and lives both in Shakespeare’s world and today’s. With her performance, The Merchant of Venice goes from that play about Shylock to this play about Portia." "Throughout the play, Miller's Portia is strong and poised; the actress effectively balances the demands on Portia to be deferential to her suiters while also retaining her agency. Miller shows clearly that Portia is always the smartest and most socially nimble person in any room she occupies, even if she is restrained in her decisions by her father's will." "The Shakespeare Theatre of New Jersey has filled the bill with a top-flight revival of "Fallen Angels"...The women- are so good that you may fail to notice the men..."
"Actresses Julie Jesneck, in her stunning Company debut, and a magnificent Melissa Miller play the sympathetically neurotic wives with impeccable comedic timing." "The director...has created a flawless production. The cast is spot-on...pure Coward perfection...the women brilliantly steal the show. The drunken dinner scene in the Second Act between Julie Jesneck and Melissa Miller is the hilarious highpoint of the evening." "...director Matthew Arbour...has been blessed with the gifted talents of Julie Jesneck as Julia and Melissa Miller as her best friend Jane." "Julie Jesneck, as Julia, and Melissa Miller, as Jane, are a sensational daring duo as the stars of Fallen Angels. Their humor is right on target and they deliver their lines with an impeccable sense of timing..."
But Matthew Arbour has a light touch in directing and a good eye for casting. Julie Jesneck and Melissa Miller, who play Julia and Jane respectively, are enormously appealing and just plain adorable." 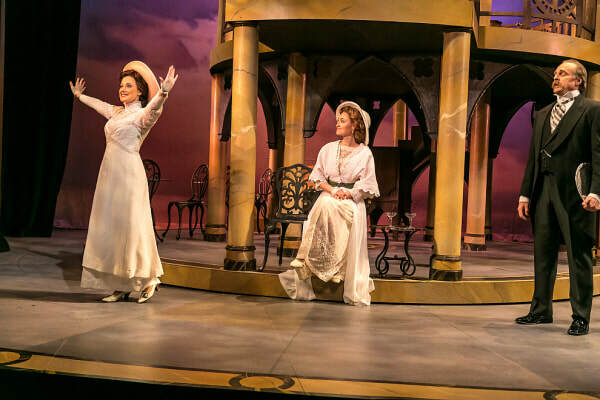 "The Shakespeare Theatre of New Jersey is putting on an uproarious production of this frothy, witty play...Both actresses, Julie Jesneck as Julia Sterroll and Melissa Miller as Jane Banbury play their parts to the hilt." "Melissa Miller's Billie is easily the highlight of the show... There could be a temptation to push Billie toward caricature, but Miller shows restraint at the right moments while allowing the quirks and humor of Billie to resonate. Her well-polished comic timing and energy propels the second and third acts." " ... Melissa Miller's Billie Dawn is masterly." "The key comic role in the show is Billie Dawn, and Melissa Miller delivers. In the early scenes, she gets this wonderful "lights are on but nobody's home" expression in her eyes that beautifully signals how disconnected her character is from the life of the mind.... Miller conveys an effective combination of worldliness and innocence in the role." "PPT's "Born Yesterday" is fantastic, entertaining to the end- endless relatable, thanks to the talented Melissa Miller..."
"If you are unfamiliar with the actors in the excellent new Long Wharf production of “My Name Is Asher Lev,” just imagine Kevin Kline and Mary Beth Hurt as the parents and a very young Richard Thomas as their son. The cast sometimes evokes those colleagues of theirs." "Gordon Edelstein has directed his three-person cast with humor and a sense of incurable remorse....Melissa Miller does a lovely, deeply felt job as Riv, Asher’s mother, who is torn between supporting her son in his joy and being loyal to her husband, who is often traveling, opening yeshivas all around the world." unusual clarity the light and the dark in Shakespeare’s characters..."
prejudice against Jews and by her guilt at having abandoned her father." far more tenderness to her than is customary, as with a pat on the cheek." for example, manages to seem riven in two over abandoning her father and faith to run away with a lover". "Perhaps the most ill-fitting character—Big Hog aside--remains one the strongest throughout: Karen (Melissa Miller), a struggling actress and an old friend of Zoe's with very zen and completely earnest ideas about the world's dire lack of love. Miller's a live wire in scenes with Biehl and Munar, at once aloof and intense, hilarious but with potentially dangerous or selfish intentions (despite Karen's professed desire to share her bounty of love with the world)." an impertinent 14-year-old and an Old World Jewish immigrant."